"Wabbit!" The Wabbit turned slightly. "Hello Skratch." Skratch could see the Wabbit was disgruntled and approached with caution. "Anything wrong?" The Wabbit sighed a deep sigh. "Look what they're doing to my city." "It's maintenance Wabbit," said Skratch. "The old gates will be as good as new." "I don't like things as good as new," said the Wabbit. "I like things the way they were." Skratch knew it was futile to argue so he changed the subject. "We need to talk," he said, "we have a critical mission." The Wabbit brightened immediately. Skratch became grave. "We need to find something." The Wabbit shrugged. "It's something unobtainable," purred Skratch. The Wabbit waited with anticipation. "Years ago some famous jazz musicians got together." 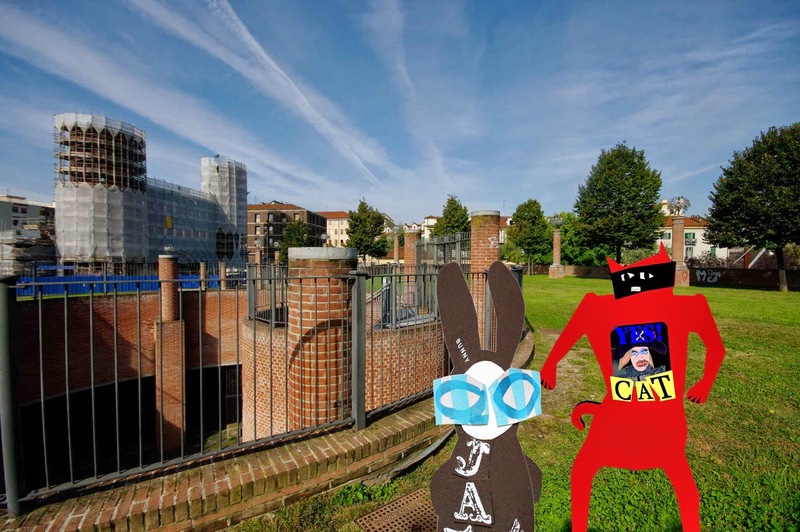 The Wabbit's eyes glistened as Skratch continued. "They played a session only for their families." "Someone made a secret recording," said the Wabbit immediately. Skratch was astonished. The Wabbit grinned. "I would have." "Wait until you hear this," breathed Skratch. "A limited pressing was made and scratched on one disc was a sign." The Wabbit inclined his head. "It was for a chord. A chord that's never been heard." "What?" yelled the Wabbit. "Everyone died of course," miaowed Skratch, "and the records were junked." "Only that copy survives?" said the Wabbit. Skratch nodded. "Intelligence suggests it's somewhere here." "There's something else, isn't there?" said the Wabbit. Skratch shook his head. "They say the devil lost that chord." The Wabbit's fur stood on end. "And he's trying to find it!"